9Wishes is a Korean beauty brand which was unknown to me before. If you look at their official site you will also see that have a small range of beauty products and that the page is relatively new, so I guess the brand is quite new as well. The products have a sleek and pretty design and make me curious to try more. 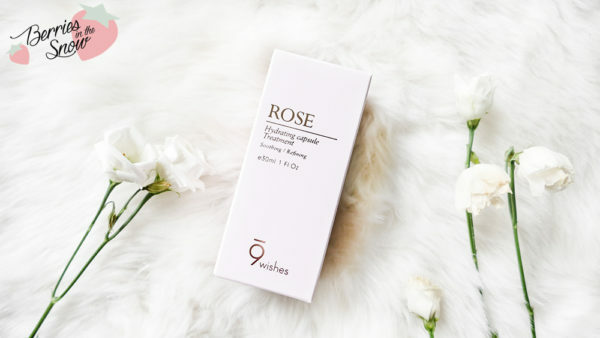 The 9Wishes Rose Hydrating Capsule Treatment comes in a pale pink cardboard box with English and Korean description written onto. It doesn’t look especially fancy, but very simple. But inside you will discover the beautiful bottle containing the product and on my first glance I fell in love it! Look at that gorgeous pump bottle with rose-gold cap. And the treatment has even a pale pink color contains bits of rose petals (I guess) in it! 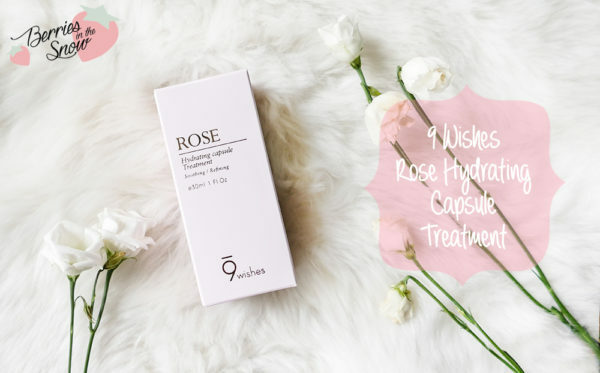 The 9Wishes Rose Hydrating Capsule Treatment is supposed to maximize the skin’s natural night-time renewal process and uses their special oil encapsulation technology for it. Although it is targeting the night-time renewal of the skin it can be used in the mornings and evenings on your cleansed face before using your moisturizer. You can see that there are various plant-based ingredients and especially a lot of rose extract and oils. 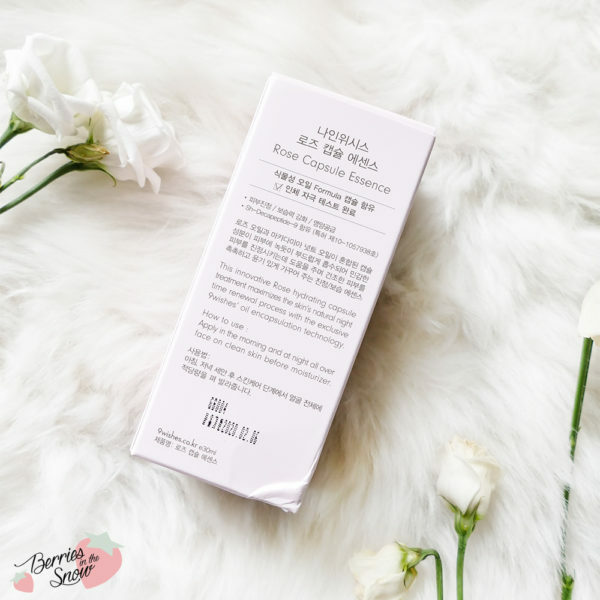 The product is alcohol-free, sulphate-free and paraben-free. Apart from rose it contains a lot of Hyaluronic Acid for moisturizing, but also macadamia oil. Further more it contains Licorice Extract, which is one of my favourites. 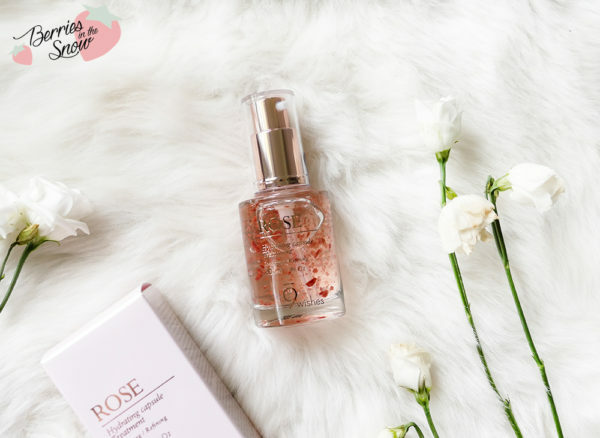 At the moment I’m trying a new tool for ingredients analytics and it is quite nice and I can recommend you to have a look at it: it is called Skincarisma and you can find the analysis of the 9Wishes Rose Hydrating Capsule Treatment >>here<<. 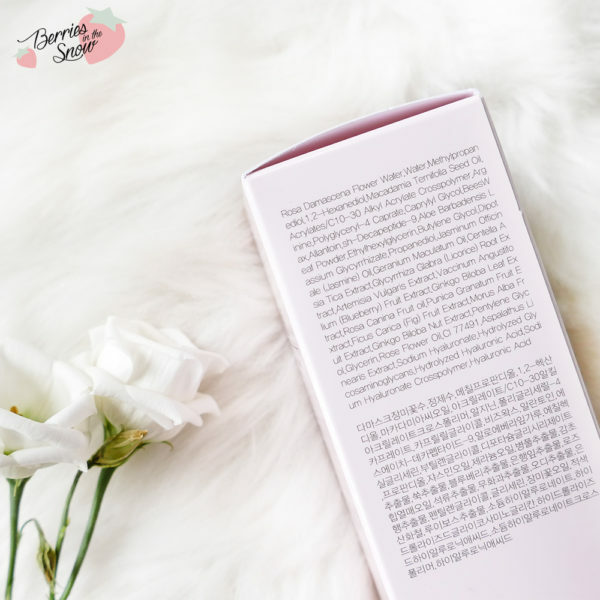 As you can see from the ingredients this treatment is especially suited for dry skintypes, but also contains some ingredients that promote wound healing. Since it contains jasmine oil and geranium oil people with sensitive skintypes should keep in mind whether they react to these ingredients or not. According to COSDNA and Skincarisma the ingredients are safe to use, only the jasmine oil has to be noted for sensitive people. 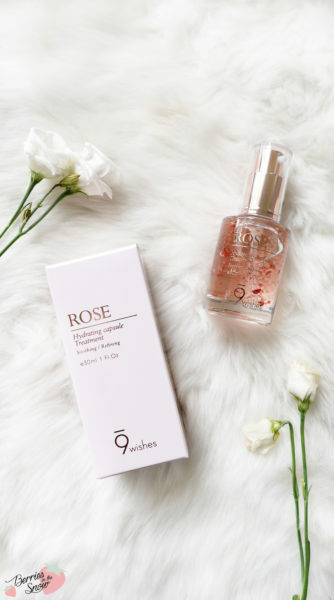 The 9Wishes Rose Hydrating Capsule Treatment is a gel type essence with a rose scent. Despite of the oils the application feels moist and watery and the product absorbs very quickly into the skin. The pink particles dissolve while rubbing the essence into the skin. Once absorbed there is no trace of oiliness or stickiness noticeable. The glow and shimmer that you see on the picture below is only visible during the short moment while it absorbs. Afterwards there is no glow left on the skin, but it fully absorbs and leaves the skin matte, leaving only the rose scent behind. The skin feels hydrated on the area where you apply the essence. You only need one or two pumps of the product to cover your face and in the time I’ve been using it I never had a bad reaction. Of course everyone is different, so be sure to check the ingredients before using and make a patch test on another part of your body if you know that your skin could react to it. I’m completely happy with the 9Wishes Rose Hydrating Capsule Treatment and I feel sad that there is only one-third left in my bottle. I received this essence from BBCOSMETIC where it retails for 19 US$ and is on sale. You can use the code Q2C8JX9N45R3O for a chance of 10 % off your order, too! 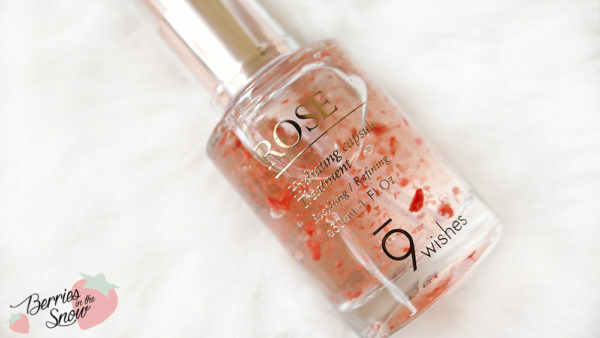 You can also get the 9Wishes Rose Hydrating Capsule Treatment on amazon.com for 35.20US$. Did you hear about the brand 9Wishes? Have you tried any of their products? 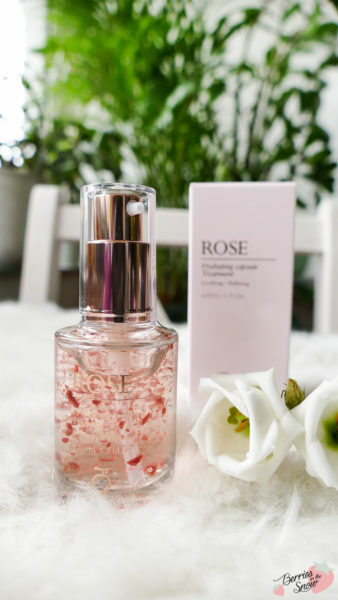 What do you think about roses as ingredients in cosmetics? Das Produkt sieht ja im Fläschchen schon richtig toll aus. Ich bin kein großer Fan von Rosenduft, aber sonst klingt es wirklich gut. Sandy last post…Das Huawei Nova 2: der Selfie Superstar unter den Smartphones? Das hört sich nicht nur richtig gut an, das Produkt sieht auch so vielversprechend aus! Wirklich schön.